Author: Hankins, Barry, Kidd, Thomas S.
This is a 2015 book by two Baylor University history professors. It contains 13 chapters plus Preface and Conclusion, about 250 pages in all. The authors take you from the colonial days when the Baptists were basically “outlaws” to the culture and state laws, to the 21st century. 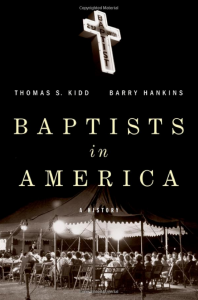 Though I have read Baptist history many times, I learned a lot from this new book. The chapter on “Baptists and Disestablishment” was the best thing I have read on the Baptist struggle to eliminate the possibility of established (or “state”) churches and the public tax to support them. The Baptist influence on both Thomas Jefferson and James Madison to separate the church and state in these matters was crucial. The authors did a thorough job of detailing the first Baptists in England and America and especially highlighting Roger Williams and John Clarke, as well as the critical role played by Rhode Island and Virginia. The book is especially weighted toward the history of Black Baptists and the Baptist attitude toward slavery and emancipation. This largely includes the Southern Baptist Convention and its attitudes during the Civil War era, and also the American Baptist Churches, USA which is the current form of the black National Baptist Convention USA Inc. There is a lot of water that has gone under the bridge, both good and bad, over the last 150 years in Baptist racial relations. Kidd and Hankins conclude by trying to describe what being a Baptist means. They confess that Baptists have been all over the landscape in doctrine and practice and even on cultural issues. They conclude that being a Baptist has at least three features: 1) Immersion of adult converts; 2) independence of local churches; and 3) a willingness to call oneself a Baptist. Not that this is all, by any means, that Baptists have stood for, but the authors feel this separates them from other groups who hold many things in common with them. As a Baptist myself, I would like a little stronger conclusion, but the book is worth the time and money to read.